We offer a fantastic line of outdoor furniture. Proven to last, hold color and provide comfort. The problem with most outdoor furniture is it requires work! Berlin Gardens furniture has a twenty year outside/uncovered guarantee! The material is earth friendly, using the highest grade of poly lumber. There is a visible difference in the quality of the material and craftsmanship compared to other furniture of the like. Do you have a problem with your lawn furniture blowing away? Not a problem with Berlin Gardens Furniture. Solid and reliable. There are many options on cushions and pillows using Sunbrella fabrics. Adding color and texture to a landscape is not limited to plant material. 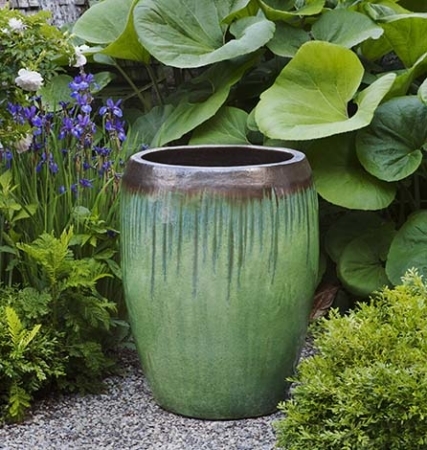 Used properly, garden ornaments such as pots, urns, planters, fountains and statuary can add structure and interest. We have a unique line of materials available. High quality and classy, a special piece may be just what the garden is missing.